Life, or some approximations of it. The miracle of life isn’t only that we are born, but that we live for any appreciable time after that, given the frailty of existence. Each of us is a highly-porous container in which thermodynamically unfavorable reactions are coupled with ATP hydrolysis to keep us “alive”. Life is not meaningless because it is a chain of chemical processes of finite duration. It is precious precisely because it is ephemeral. There is an insurmountable mountain of books to read, songs to listen to, people to meet, and places to visit in a short time. It is an impossible undertaking. There are only a few years to find out one thing (however arcane) that no other human knew before, to create something new- before the blip on the radar ends. Each discovery opens doors to many more questions that will not be answered in a lifetime. You can spend an entire lifetime searching for the right questions to ask, never mind figuring out the answers. Perhaps, it is well that we only see a fraction of the stars that exist; of the myriad beings that inhabit earth. We are terrible custodians, undeserving of that which we have been given. How should we be worthy of more than this? You wake up in a daze. And just as your eyes find clarity– you realize that your life is not as good as you had once hoped, nor as bad as you had once feared. Life happens as you search for and abandon all hope of finding its meaning. Life finally finds whatever meaning you give to it. Every one of us is more than one person, lining up in a continuous row, changing over time. The young person in the photograph in front of you is both you and not you. Be a role-model for that younger self. If that is too high a standard, be an older friend. If that is also too difficult, try not to embarrass him or her all the time. You might have more real-world experience, but your younger self had more worthy ideals. Tell people what you have discovered in life, but know that you are not infallible. You are not irreplaceable either: the person you are training is your replacement. If you are lucky, one day, you might be able to take pride in finding that your replacement knows more than you ever did. That is how life is and also how it should be. The question of how you will be remembered after you are gone is really not important. It should not just be humbling, but also a source of great joy if the world goes on virtually unchanged after you are gone. If leaving causes as little disruption to as few people as possible- that should be a sign of a successful life too. Forget authorship, your existence will have been a success if you are mentioned in the acknowledgements section of someone else’s life. Each one of us carries within ourselves a number of identities. Some identities, like our lineages, are inherited. Others are acquired and can be shuffled around like credit cards in a wallet. Because we use languages to communicate, our linguistic identities– whether they arise purely by accident or as a result of conscious choices– are particularly dear to us. Languages are a beautiful invention. They are are inclusive and inviting, even when individual speakers are not. Becoming fluent in a multitude of languages gives us wondrous new vistas into the mind. The first words I remember from my childhood were in Bengali. It was the language my parents and grandparents spoke amongst themselves. Very early on in life, it was the language I exclusively spoke in as well. It was only when I turned four and I was transplanted to a new country that I first began to hear English. Spending many of my formative years in a country where it is the language of communication, English quickly became my primary language. Bengali did not vanish altogether, but rather became a language of conversation – a home, in which I found my own name pronounced properly in the voice of those who loved me most. Over the next few decades, I picked up bits and pieces of other languages that I stitched together into new identities. Every language I encounter opens a window into the minds of the people who use it. I discover new words that have new meanings and are not perfectly translatable into languages I knew before then. Sometimes, I still cannot find the right word to express myself in any language. And often during those times, I have been astonished to find that the right words to express my own thoughts are in the writing of another. I am grateful to writers who were born before me- Rabindranath Tagore, Bertrand Russell, and Octavio Paz – for this. It is true that we judge others by how well they speak languages we know ourselves. Quite often we automatically consider someone attempting, but unable to speak, a language we know well to be unintelligent. I have been in the midst of people whose primary language I did not know, and have found myself in that situation. There is a feeling of helplessness in not being able to stay attuned to what others are saying around us. Languages evolve over time. Some languages lose their prior status. 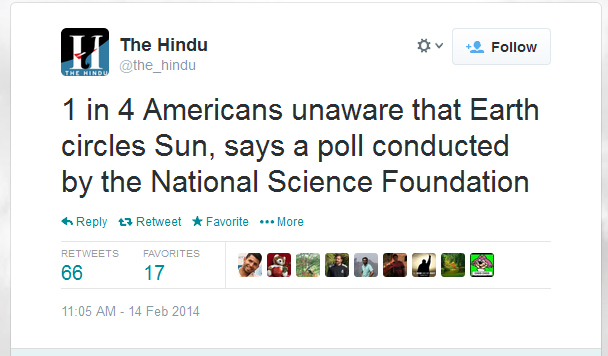 My ancestors had a working knowledge of Sanskrit. I never got around to learning more than a few words. By not making a reasonable attempt to learn Sanskrit, I cannot help but feel that I’m losing something that I should’ve made more of an attempt to hold on to. I am reminded of Ayapeneco, a language spoken in a village in Mexico. As the story goes, there are only two living people who know that language. When they die, the language, Ayapeneco will die with them. That linguistic tradition of a people will be gone forever. I have been thinking about language-based identities for another tangible reason. My son recently graduated from the language of made-up words to conventional ones. My wife and I make every effort to communicate with him in Bengali, but we’ve noticed that he already shows a preference for English. For my son, living in the United States, the pressure to learn English in order to be able to communicate with his peers is immense. Conversely, the incentive to learn Bengali, the language of his parents and grandparents, is minimal. He already knows that my wife and I are multilingual, and just as likely to respond if he speaks in English. It took me a while to understand just why I was alarmed that my son was showing an overwhelming preference for English over Bengali. One of the key identities that a first-generation immigrant holds on to is language. It feeds the illusion that he has never actually left, and that, if necessary, one day he can return. Naturally, the immigrant wishes to pass along this key identity to his offspring, so that he bequeaths an unbroken chain to the old country. I have come to terms with the thought that my son might never understand or love Bengali as much as I do. That is fine. But as part of his inheritance I would like him to learn at least a few words in the language of his parents. I would like him to have the option to fall back on it and think that his mother and father are talking to him, even when we are not around. In return, I am ready to learn the meanings of new words in languages my son decides are worth learning on the path to adding new identities. (Reposting a short piece I wrote for Dukool). 1. The best goals are the ones that almost get scored. 2. The outcome, like life, is seldom fair. You can attack well for 1 minute out of 90 and win (USA vs. Ghana) or defend poorly for 1 minute and concede the victory (USA vs. Portugal). You can lose and still qualify. And it might make you sick in the stomach or jump for joy, but that is how it is. 3. This game is always about mistakes: it is all about human passions. If people played like robots, we would have 0-0 draws every time. 4. Never get into debates about how a star player is performing with someone of the same nationality as the player. 5. The goalkeeper and the talented striker are the two most important players on the team. 6. There is a correlation between teams that traditionally don’t do well and how much they complain that the dice are stacked against them. Correlation is not causation. 7. Refereeing decisions tend to go in favor of teams that traditionally do well. Correlation is not causation. 8. There are no permanent enemies or friends in football. Except in derby matches. 9. The better side wins. Always. But ONLY if you believe the logic that the side that wins is better. 10. You can try to mask your emotions, but there are no neutrals when a goal is scored. Your allegiance will show when the ball crosses the line. If you are reading this, then chances are you know me well enough to know that I lead a godless life, by which I mean that I do not believe in the assumed power of gods and goddesses (either in the singular or plural) to exert any control over anyone’s life. The perceivable world is chaotic, but deterministic. The underlying quantum framework may or may not be. We do not know yet. But to me, life exists solely and completely within the realm of physical laws, chemical reactions and biological imperatives. I find no evidence to convince me that there are any preordained moral hierarchies holding the universe in its place. I also respect those who do not agree with my view. Most of the people I have met in my life are religious. And most of the people I have met, irrespective of whether they are religious or not, are good people. For most people, religion is needed to fill a void. Others, like me, who do not believe in divine powers, have quite different philosophies to address the void. What is common to the human condition is the void that needs filling. I accept as reality that this life, of finite duration, is all that I have. I cannot honestly believe in an afterlife. It is that simple. You simply cannot fake what you believe in by going through the motions. You may think that all of this is a form of nihilism, but I think the opposite is true. Life is precious, precisely because it is finite. We are the ones that almost never made it. Yet despite the inconceivable odds, we are here, and this is life, happening right now. And life will continue to happen as we search for and give our own meaning to it, or abandon any hope of finding one. It is a sobering thought: that although we are tiny in the grand scheme of things, we must take responsibility for our own actions, because there is no one else who can. Two. I love the way you say it as you rattle off numbers from one to ten. The number itself does not mean anything to you yet, just as your birthday carries no special significance in your mind. For us though, the passing of another year of your life is a cause for celebration. Your birthday is inordinately more important to us than ours. Grant us this: we need the bright balloons, sugary cakes, and silly, conical hats more than you do. As I reflect over the last year, memories surface indiscriminately. It has been a momentous year, indeed! Now, you can build with blocks and paint with fingers. You have precise expressions including vocabularies of refined gestures and words. You recognize symbols including letters and numbers. You have developed tastes for certain kinds of food and preferences for specific activities. And then there are the myriad puzzles and games! We have found onions in the washing machine and crayons in the sofa cushions. I used to find peanuts in my shoes, until one day you decided you needed to wear them more than I did. With my hat covering your eyes and my gloves on your hands, you looked like a hard-boiled private-eye from a Raymond Chandler novel. After that moment nothing was quite noir anymore. We ignored the smudges on the television or the trail of Cheerios on the just -cleaned carpet. One day I asked your mother, “Why is one of my CDs in the bathtub?” She looked at you. You looked at the teddy bear. The bear had no alibi. Was there was a miscarriage of justice that day? I cannot say that the thought weighs very heavily on my conscience. Early on, you used to say “hi” into the remote-control. We thought that it was cute. Not anymore. You know what all the important buttons do (and even I don’t know what some of the buttons do… set off a nuclear device, perhaps?) We had to hide the remotes until we could no longer find them ourselves. Now we just watch whatever is on the last-known-channel. A few months ago, I had to enable a passcode on all my mobile devices. It wasn’t because of thieves, it was because of you. It was fine as long as you were sending out blank calls and tweets on my behalf. One time, you nearly emailed my boss. I shrugged. What can a little boy do, after all? But I had to draw the line when you deleted an app with high-scores I had been working for months to get. No fair, buddy. Forget the app. I confess that it is been a losing campaign to baby-proof the world (or rather to adult-proof yours). You mastered the skill of opening doors and chocolate wrappers. Of tiptoeing to pinch items off progressively higher shelves. Of staging an impromptu sit-in the middle of the toys-section of a shopping mall. Speaking of toys, I was very excited when we got you Lego building blocks, model miniature cars, and comic-book action figures. Excited for you, of course. I put that out there, in case you doubt my parental gravitas. We’ve had our share of adventures this past year. We have visited Mayan ruins in Mexico and Jain ruins in India. We have gazed at waterfalls and loafed on beaches. We have waved at strangers and have slid down chutes. We collected acorns and ran through piles of raked leaves. We read books together. We laughed at dinosaur replicas in museums and then ran in horror from the vacuum cleaner at home. I have to ask. My child, what do you think of when you smile in your sleep? Licking rocks? Petting trees? Wiggling toes in water? Unrolling toilet paper? We graduated from peek-a-boo to hide-and-seek. You would hide behind a row of trousers in the closet. “Where are you? I can’t see you,” I would say with a serious expression on my face. You would emerge with a triumphant smile from behind aforementioned trousers. Although we kept playing the game, despite my competitive streak, you always beat me. I never got any smarter. Every morning I have noticed your urgency in trying to prevent me from leaving for work despite the flabbergasting 2/7 chance of success. There are many concepts besides work that I have been unable to explain to you this year – business-travel, private property, illness. On the other hand, there is much that I have learned this last year. Not just about you, but about myself and about your mother. (Here’s a secret you don’t have to tell your mother and she’s not going to read this: be grateful that she is your mother). In trying to teach you patience, over the last year, I have tested, crossed, and expanded the limits of my own, and taught myself. So much changes in a few years. You were born only two years ago. One year ago you walked. Now you can run. As you’ve grown over the last year, you’ve started to develop a mind of your own. As a parent I’ve had to wrestle simultaneously with two contradictory observations: you’re growing up too fast, and you’re not growing up fast enough. It is humbling to think that the balance will one day shift overwhelmingly in the direction of the first. Stay well, my son. When you wake up from your nap, we will all have some cake. The fact that 1 in 4 people in the world’s most technologically advanced country had no knowledge of one of the primary tenets of science came as a shock to me, as it did to everyone else reading it. To get a bit of context, I searched for the original data obtained through a questionnaire on general awareness by the National Science Foundation of the United States. It is available as part of a very interesting report here. I haven’t had time to digest all of the data yet, but it seems that a very large proportion of people worldwide who are literate (by the standards of the general definition) are scientifically illiterate. 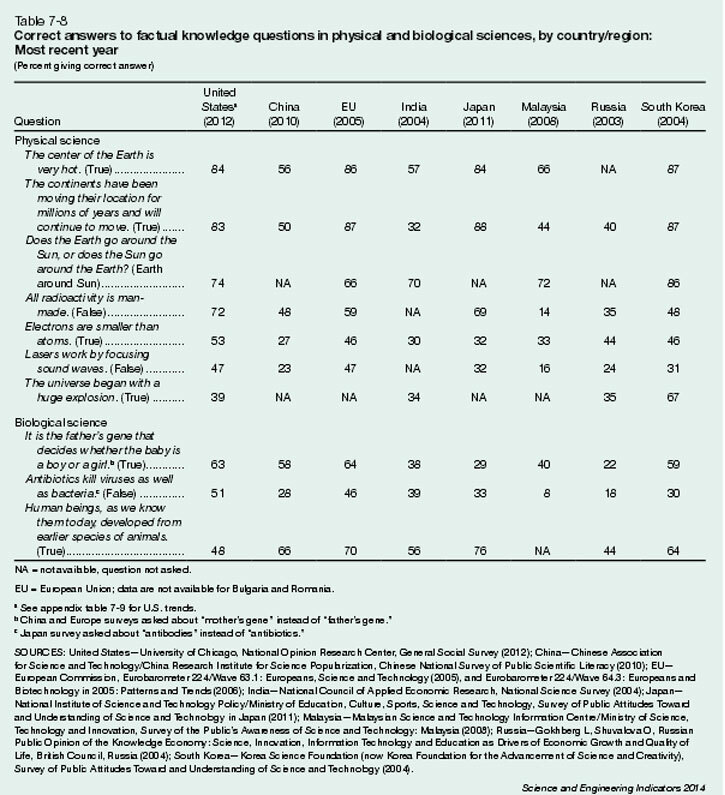 It turns out that Americans, or at least those surveyed did not do as poorly on many questions as those in other parts of the world. To me at least, what seemed most worrisome with respect to the United States were the two questions in which it fared the worst – tied to evolution and the acceptance of the Big Bang theory. I’m not aware of any conservative organization in the US which promotes geocentricism, but I know of many in this country which take the immutability of the humans species and the creation stories of the Abrahamic religions at face value.